renvntng how 2 read nd spel? nd if the bk cn qualify as gr8. nd the nu cn b a lttl hard. like whats the snd of 1 hand prssing snd? Poetry & Popular Culture correspondent James Sullivan breezes in to report on poetry, festival broadsides, and the winds of change a-blowin' in the Land of Lincoln. that is, power to move things. over and upon the same space. The broadside they set up at their booth was 3’ by 4’, and the one I obtained from them is 8½” by 11”. 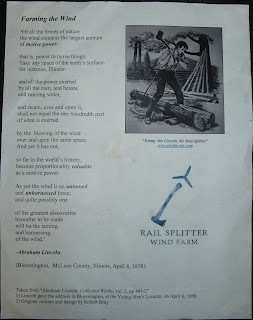 It has, in the upper right, a reproduction of an old illustration of young Abe a-splittin’ rails; below that, the wind farm’s logo—propellers at the end of an ax handle; and a citation of the source at the bottom—a speech in Bloomington, IL, April 8, 1858. Rail Splitter Wind Farm, LLC, is owned, though the broadside doesn’t mention this, by Horizon Wind Energy, LLC, of Houston, TX, which is in turn owned by Energias de Portugal (EDP), SA, the biggest utility in Portugal and a major player in the international renewable energy business. Interesting little bit of propaganda in my hands here. While I am a proponent of wind power, myself, some of my neighbors dislike the idea of the view and (they fear) the sound. To mitigate the fear of technological progress and its impact on the life of our small town, this enormous international corporation turns, of course, to poetry. As poetry, “Farming the Wind” has the flat-footedness of Edgar Lee Masters or Carl Sandburg at their most prosaic. That’s no coincidence. These are some of the local literary heroes in this part of Illinois. There’s nothing romantic and luscious about this sort of poetry. Spoon River Anthology, after all, took a clear-eyed view of small-town life, without sentiment or nostalgia. This is not some pretty, lilting evocation of sunset over the corn, but a vision of power. In fact, they bold and italicize several words—“motive power,” “valuable,” “untamed,” and “unharnessed”—that might add to the testosterone appeal of the text. The verse, then, in its stylistic evocation of local writers, suggests that the wind farm is not an imposition—some huge corporation descending upon us from Houston and beyond and forcing its will upon our beloved landscape—but rather a fulfillment of the potential inherent in the local. And then there’s the other and stronger Central Illinois connection, one more evocative than any other: Lincoln. Ah, what a visionary! He saw and believed in this project before it had ever been conceived! Surely we must finish this work to which he called us! James Sullivan is the author of On the Walls and in the Streets: American Poetry Broadsides from the 1960s. He teaches English at Illinois Central College and, among other things, raises llamas in Delavan.